Although it's built upon the underpinnings of Subaru's latest Impreza, the new 5-passenger XV Crosstrek delivers the all-terrain prowess and versatility of the Subaru Outback, but in a smaller, sportier package. 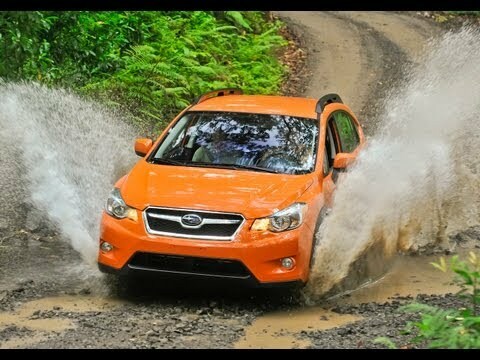 Beyond its practical 5-door design and striking good looks, the 2013 XV Crosstrek is also the most fuel-efficient all-wheel-drive SUV available. Summary of 2013 Subaru vehicle. I have a 2013 Subaru xv Crosstrek. It is an cvt engine which means it is both automatic and manual. It is all wheel drive and is great in the snow. It can tow 1500 lbs. if you have a hitch. I have a sunroof, and basic radio, which I love. I do not need anything fancy. But what I love, is that it has a hookup for your iPod/smartphone so you can play music from your device and have it play on your radio. Which I love. I use it often when I go on road trips and I am not familiar with the radio stations. It seats 5, 2 in front and 3 in the back seat. The seats have warmers, and a/c and heat work great. You can change the oil yourself and it is a v4 engine. It has great gas mileage, one time I got up to 45 miles per gallon on the interstate while I was on the road for several hours. But most of the time when I am driving on the highway I get an average between 30-35 mpg depending on what type of gasoline I put in it and my tire pressure, etc.. Which all relates to the mpg. In the city, it gets an average of 20-25 mpg which isn't bad either. I love my Subaru and I recommend it to anyone interested in a very reliable vehicle! I absolutely love my Subaru Crosstrek. I have had no issues with the car in the two years I have had it. I love the 18 inch clearance as it allows me to take my car off-road to remote camping places and campsites with no problems. It looks great in the outdoors and performs perfectly. I have taken it into the snow which has also been a great experience. I find that the tires handle well on all terrain I have experienced. Maintenance is simple because issues rarely arise with my Subaru. The oil is extremely easy to change, even for a rookie. The backseat is spacious and comfortable. The trunk is plenty large for camping equipment, sports equipment or any other bulky items. The interior is simple, but the Crosstrek offers nice features such as sunroof, backup camera, and roof racks. I have a roof top box on my car and it has not negatively impacted my gas mileage at all. I find that I consistently get 33 mpg on the highway with slightly less if I am driving surface streets. The colors offered by Subaru are also great and allow a person to show more of their personality through their vehicle. I have no complaints. The only problem I've ever had with my car is occasionally my traction control, ABS, and anti roll back lights all turn on, for no reason apparent to me and then just as randomly as they turn on, they'll turn off. Has never caused a problem but it disables my cruise control which is kind of a bummer. It is awesome on gas and doesn't cost much to fill. It's a little smaller than it looks from the outside and I've had some problems fitting things inside but that's really minor. It has Bluetooth connect-ability which is an awesome feature with hands free controls built into the steering wheel. Currently at 115,000 miles and counting. Drove it from New Hampton to Illinois and back without incident,and it still has never broken down on me(fingers crossed).